Herds milked once-a-day (OAD) for the whole season tend to have better reproductive performance than herds milked twice-a-day (TAD) for the whole season. There are various reasons that farmers milk OAD, but many will tell you that their herds reproductive performance lifted when they switched from TAD milking. To find out whether OAD herds really do have better reproductive performance, we compared the reproductive performance of OAD herds against herds that milk TAD for the whole season using the results from the 2014 to 2016 seasons*. Averaging the performance across all three seasons, the results show that herds milked OAD all season do, on average, have better reproductive performance than herds milked TAD all season. Across the three seasons, the average 6-week in-calf rate of the OAD herds was 75% versus the TAD average of 65%. This result puts the OAD herds in top quartile of reproductive performance in New Zealand. The OAD herds also achieved a lower not-in-calf rate, despite a slightly shorter mating length (about 4 days). Not-in-calf rate is an important figure as the number of non-pregnant cows impacts your ability to cull the cows you want to. The 75% average 6-week in-calf rate of the OAD herds is just short of the industry target of 78%, but their 10.4% higher 6-week in-calf rate is helping to bring in the dollars. Using DairyNZ’s economic multiplier of $4/cow for every 1% increase in 6-week in-calf rate, this 10.4% difference is worth approximately $4,160 per 100 cows! And this figure nearly doubles when you add in the benefit of a lower not-in-calf rate. 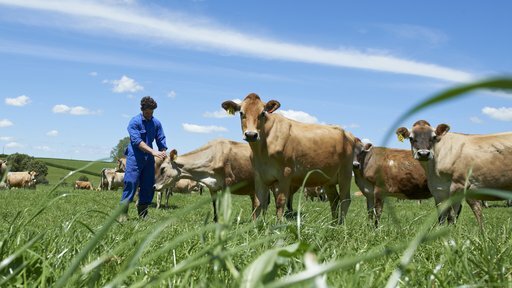 DairyNZ estimates that every 1% decrease in not-in-calf rate is worth $10/cow in the herd. This makes the 4.8% lower not-in-calf rate of the OAD herds worth approximately $4,800 per 100 cows in their herd. For a 400 cow herd, this higher reproductive performance would be worth around $35,840! There were 30 herds that were OAD for all three seasons. Their results follow very much the same trends as those reported above. This indicates that the reproduction benefits from milking OAD all season can be maintained year after year. There is a strong indication that milking once-a-day for the whole season has beneficial effects on herd reproductive performance. This is good news for those of you already milking OAD, but doesn’t mean everyone has to go OAD to get good results. In the spring 2016 season, 11% of the herds across the country* had a 6-week in-calf rate the same or higher than the OAD average of 75%. However, for those who are struggling to get good performance in a TAD system due to challenges that cannot be overcome through other management practices (e.g. long walking distances etc. ), OAD might be a way to improve reproductive performance. Before switching to OAD, you need to consider if the OAD system is right for you. It’s important to remember that OAD has milk production impacts, and often involves other farm system adjustments such as stocking rate. It’s recommended that you seek professional advice before making the switch. To be classified as a herd that is OAD or TAD for the whole season herd, they needed to herd test three or more times a season and have the same milking regime (OAD or TAD) at each test. To allow comparison of herds with quality reproduction records, only spring calving seasonal herds with a Detailed InCalf Fertility Focus report in MINDA were included. For each season analysed (2014, 2015, and 2016), a herds results were excluded if they did not meet the selection criteria for that season. In total 75 OAD and 76 TAD herds were analysed. To remove any geographical influences, the TAD herds included were situated in similar geographical locations as the OAD herds. The OAD/TAD herds were located all over the country. If you have any questions about this article, get in touch with the Repro Team at repro@lic.co.nz. Identify bulls capable of producing high-BW offspring suited to OAD milking or buy one of our No Choice OAD Packs.